Put the Longevity Brand® Full Cream Sweetened Condensed Milk in a coffee cup. Open the Vietnamese Coffee Filter and unscrew to remove the filter’s top screen. Place the Longevity Brand® Premium Dark French Roast Ground Coffee into the filter. Replace the screen and turn until snug (should not be tight). Place the filter on top of the coffee cup. Pour boiling water into the filter until it is about 1/3 full. Wait for 30–45 seconds to let it soak. If the coffee does not flow through, loosen the screen until the coffee starts to drip. 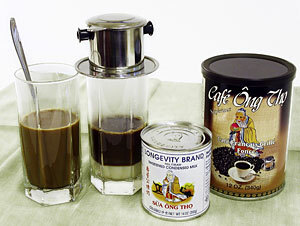 When the dripping stops, carefully remove the filter and stir the coffee to mix with the sweetened condensed milk. Follow the above preparation method and stir in a glass of ice cubes.